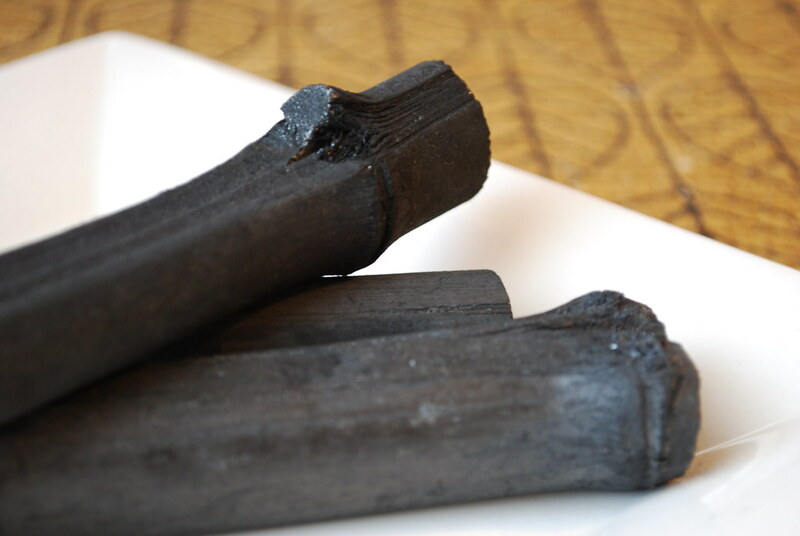 About five months ago, I came across a brief article about Bamboo Charcoal Bread by Monica Eng. The writer shared that a friend of hers had recently returned from a trip to China and brought her back a small loaf of the jet-black bread made with the powder of charred 5-year-old bamboo. The accompanying photo portrayed a squishy looking loaf of bread much more resembling of a lump of coal than something I'd want to eat for lunch. And yet, I was intrigued. It was in the description, which painted the bread as soft with a slight hint of sweetness that she thought could work perfectly in a French toast recipe. I think it was those last few words that grabbed me, because I proceeded to spend the next couple hours scouring the Internet for a local bakery that sold the loaf. "This is New York City," I thought. "It must be here somewhere." I found no mention local suppliers online, and though I popped into a couple Chinese bakeries I happened to pass that week, it was evident the mysterious loaf had yet to reach American shores. So I decided to try and make it myself! I did a few searches for recipes online, but there weren’t any. I kept coming across random blog entries from bloggers in various Asian countries around the world who saw the bread in a local bakery and gave it a try. I e-mailed a few of them and left comments on the blogs of others, each time telling them about my little quest and asking them if they knew where I could find a recipe. Soon, the responses started to roll in. The first blogger, a teenage girl in Malaysia, told me that she didn’t have a recipe, but suggested a few bakeries in her city where I could find the bread if I was ever in town. 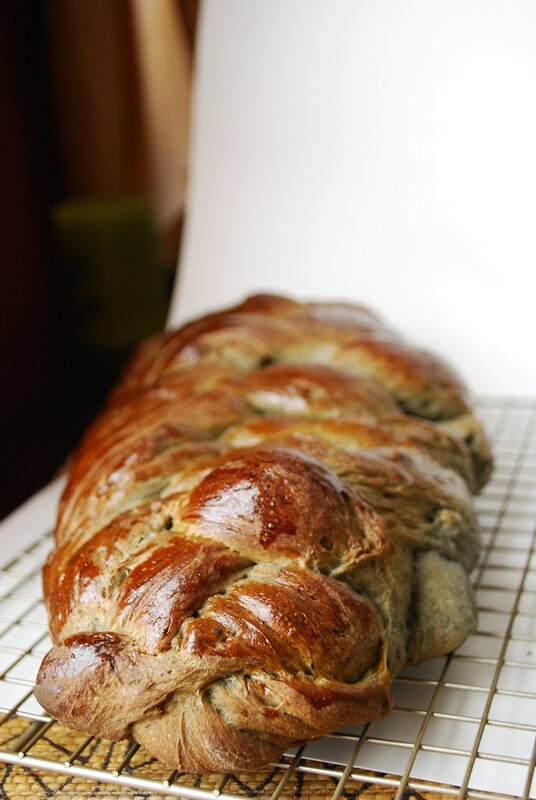 A second blogger from Singapore suggested that I look up recipes for Green Tea Bread and then simply replace the amount of green tea powder with an equal amount of bamboo charcoal powder. She cautioned that I should make sure to use bamboo charcoal powder as that it contains different properties than regular charcoal (more about that later). “I think I found what you’re looking for,” the writer told me. She included a link back to her post (where I’d left the initial comment) which she’d updated with a video of a Taiwanese cooking show about making bamboo charcoal French baguettes! It was completely in Chinese, but the blogger had helpfully included a rough English translation of the ingredients and recipe below the video and I was able to figure out the steps just by watching. 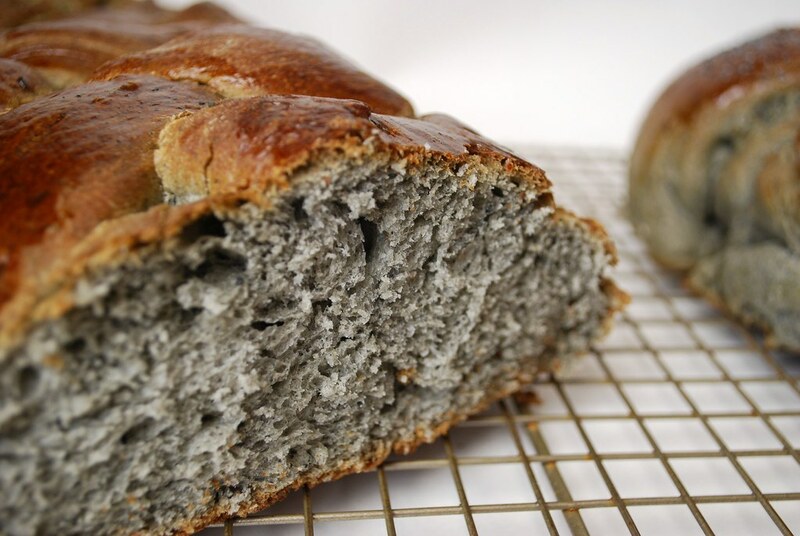 She also advised that the bamboo charcoal powder could likely be used in any bread recipe but that I should add a little malt sugar along with it to enhance the flavor, as well as a little bit of additional water. Armed with possible recipes and a new-found interest in Japanese manga,* I tackled my next challenge: finding bamboo charcoal powder. This part was even harder than finding a recipe. The only online sources I found were international distributors who sell bulk to importers. Unless I wanted several thousand kilos of bamboo charcoal, that wasn’t going to work. While researching, I learned that bamboo charcoal is very popular all over Asia because of its believed purification properties. The charcoal sticks are often used in water or can be placed in the refrigerator or in drawers to absorb odors and moisture much the way baking soda would be used. 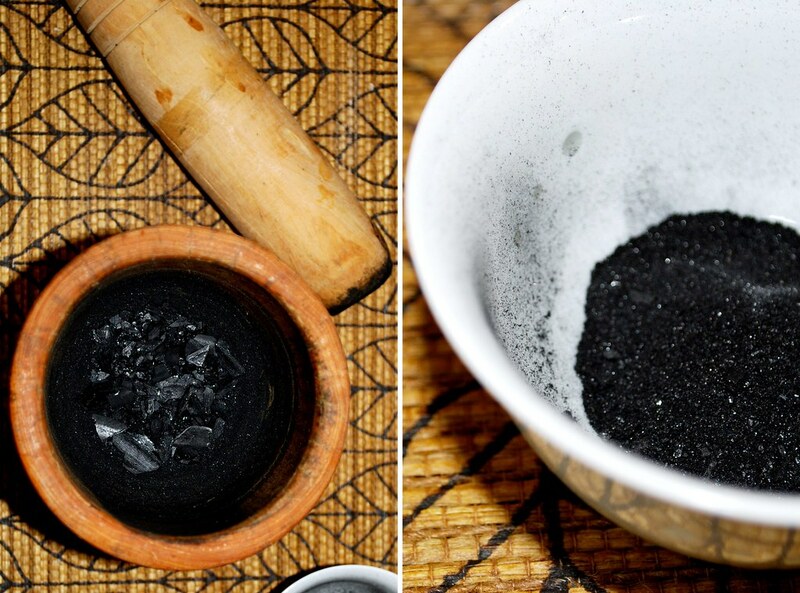 When used in the home (often displayed in a vase or basin) the charcoal helps to ionize and refresh the air. The fine powder is frequently used in face masks, soaps, and lotions since it is believed to detoxify and refresh the body and skin. And it is added to food for the same reasons: detoxification and to help eliminate harmful bacteria (such as in cases of mild food poisoning). The high mineral content also adds a subtle layer of flavor to the food and helps keep it fresher longer. Naturally, the more and more I read about these amazing sticks, the more I couldn’t wait to try them. I finally found an eBay vendor in Singapore who sells whole sticks of bamboo charcoal for water purification so I bought a package or four sticks for ten dollars (including the shipping to NY from Singapore). When they arrived, I was surprised by the texture of the sticks. They are very light and completely hollow, with a slightly brittle feel. When they hit against each other, they make an almost musical sound. On their own, they are completely odorless and tasteless. My plan was to grind one of the sticks down to a fine powder that I could then use in my bread recipe. 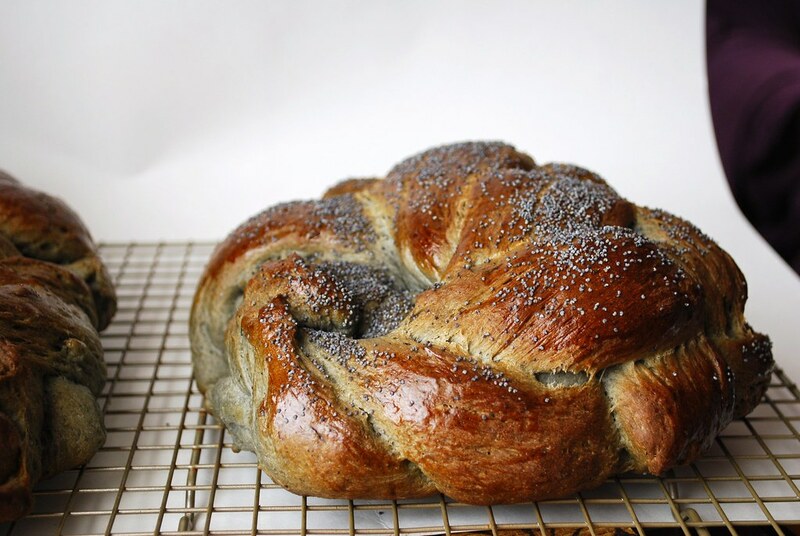 From all that I’d read, I had decided to experiment with a basic challah recipe, since the soft egg-y sweetness seemed to best match the descriptions I’d read. The results were exciting. The bread was chewy and slightly sweet, with a gorgeous charcoal gray color. I'd brushed the top with an egg wash, so it came out golden and glossy. I also sprinkled it with black poppy seeds since I thought they would complement the color (they did!). The most incredible part, was the way that the bread seemed to never get stale. We kept it loosely wrapped in plastic on the counter for about a week. Whereas my challah usually goes stale after 2 or 3 days, this bread was just as good the last day as the previous ones. I have no way if knowing it was a coincidence, but something definitely seems to suggest that it was the charcoal that kept it so fresh. If you decide to try making this for yourself, I have a one important note: Make sure you grind the charcoal very, very finely. A coffee or spice grinder would be ideal for this and then it couldn’t hurt to go over it once again with a mortar and pestle. The charcoal doesn’t dissolve, so if it’s not incredibly fine, then your bread will end up with an unpleasant sandy texture. And definitely let me know if you try it or if you have any more thoughts or knowledge about bamboo charcoal. Clearly, I’m a fan! * Side Note: I actually ended up spending quite a bit of time on her site, which is a kind of Manga fangirl/boy site. The article that mentioned the charcoal bread was about a particular Manga series called Yakitate! Japan!, which translates to “Freshly Baked! Ja-pan!, with “pan” also meaning “bread” in Japanese” It’s a story about a boy on a mission to create a “Ja-pan” or a national bread of Japan that can rival the best breads of the world in international competitions. He travels to Tokyo to study with master bakers and there gets into all kinds of exploits. Each installment of the series features various kinds of quirky bread recipes, and the website I found was a collection of all the breads he made with links and suggestions so that actual fans of the show can recreate the breads at home. I think the series sounds brilliant so I’ll definitely have to check that out at some point. Once it has foamed, pour into the base of an electric mixer and used the whisk attachment to mix in the olive oil, the two eggs (one at a time), sugar, and bamboo charcoal powder. Switch to the dough hook and slowly add the salt and the flour, one cup at a time until it comes together and pulls away from the sides. Allow to knead in the mixer until smooth. (About 5 minutes.) If the dough seems too wet, add a little more flour, ¼ cup at a time. Once the oven is ready, brush the loaf again with egg wash and sprinkle on the poppy seeds if using. Place in the oven to bake for 30-40 minutes or until the top is glossy and golden brown. Love everything about this post. I love all the research that you did and your fascinating quest. I love the way you wrote it so that we could feel like we were searching with you and I love the end result. The part about the bread lasting for a week vs 2-3 days reminded me of the miracle of Chanukah (perhaps you should make this again for Chanukah). Thanks, Stef! It was a really fun project to undertake. And I love, love the parallel to Chanukah! I love this and I'm going to try it. I posted a link to your post on our bread forum and Su'd. So fun to try new things. Thanks! Utterly fascinating! Who knew you could even eat bamboo charcoal? You remind me of my husband. When he gets obsessed with some kind of food, he just goes to extremes to research it. Good for you, and for this very insightful poast. Alejandra, this is really exciting! You've just brought a native dish from another country and made it possible for others to keep this alive! Did you find that the charcoal added any flavor at all, or was it really textural and preservative-like only? What an interesting post, I have never even heard of bamboo-charcoal bread! I liked the story of your quest to find ingredients, too. Well done! Yakitate is a brilliant series, i hope you enjoy it! I've just finished reading through all your archives thank you *so* much for creating this wonderful blog. Wow! That challah looks fabulous! I love the idea! Thanks for sharing. The charcoal really didn't add any distinct flavor to it. I think it was more about the color and the way it stayed fresh. From what I've read, i think the bread is really supposed to be something of a novelty item, with people attracted to it for the unusual color and the possible health benefits. That's so cool! I'd love to try this. So interesting about the loaf staying fresh longer. Beautiful, amazing, wonderful! One of the most fascinating and exciting bread stories I've read. I found 2 references to charcoal powder being used as an extender through the USPTO site. One application is intended for animal feed use, another combines charcoal powder with other functional ingredients to extend shelf life in baked goods. Thanks for the recipe! Since I'm in South Korea, it's easy to get charcoal sticks/powder, and I was curious about using the powder in food rather than in face masques and the like. I'll have to give this a try soon! Wow. I am seriously so impressed, by the results, sure, but more by your tenacity at finding the recipe and the ingredients and making this whole thing happen. Fascinating! How interesting! I love challah - yours looks delicious! Wow! I haven't heard of half of the ingredients in this before nor have I seen bread made with bamboo charcoal, but it looks amazing! I don't know if I'm skilled enough to try to make this myself, but if i ever come across it I will be sure to taste some. Great post! That bread is incredible! Wow, nice post. This is most fast scene of bread world..i came to know just a few months ago about Bamboo Charcoal ...i was just thrilled and sad to know that i already passed 69 years..so what i did? i remember my grandfather had left me a piece of 3 acres of red soil lands in my town of Sivakasi in Tamilnadu India. so now i planted Bamboosa vulgaris and going to make Charming Bamboo Charcoal with the help of friends from Asia.. Thanks for this. I'm going to try it for this Shabbat when we are having a South East Asian themed meal. So where should I buy the charcoal sticks in NYC? Can you direct me to an exact location by chance? Thank you! i don't know how i missed this post the first time around, but i'm happy i found it eventually! i am so excited to try this bread. apparently i can get it easily at breadtop, an asian bakery franchise that is all over AUS. one day i may even be adventurous enough to make my own.